CONGRATULATIONS to the following students for being selected to be a member of the 2019 Twin Cities Junior High Honor Band. The band will perform Saturday, April 6 at Bloomington JH School. 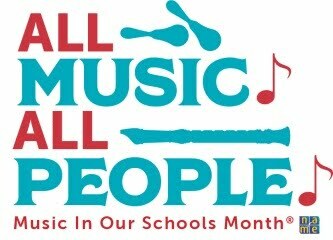 Music in our Schools Month! Please check on the 7th or 8th grade pages for specific information. You can find the parent permission form in grade specific documents. The form and money needs to be returned by Friday morning. CONGRATULATIONS Quinn Long for being selected to perform as a member of the ILMEA Distrist 3 Honor Band. Way to go Quinn!!! You will be a great representative for Chiddix!!!! The year has been off and running for several weeks now. Each grade level should find all of their concert / performance dates for the entire year on the calendar (bottom of the page and on the left). Please cross-check the dates in the lower right "Announcements" section on this home page, against the dates on the calendar (lower left). The directors are asking you to place these dates on your family calendar NOW!! We have avoided all other Chiddix events for our performances. If your child joins a team or activity outside of Chiddix (traveling sports team, dance team, independent cheer groups, etc.) we are requesting that you share these dates with the coach or sponsor of these activities that the performances are required for the student. Each grade level will have three (3) evening performances throughout the school year that the students are required / expected to attend. The 7th and 8th graders will also have a 4th required performance listed on their schedule (Saturday, April 27). 7th and 8th graders may read more about this event on their grade specific page. Regardless of the size of the performing group, EVERYONE is an integral part of the ensemble. Missing even one person will affect the performance of the entire ensemble. When you put these dates on your calendar tonight and you notice that you already have a "once in a lifetime" event (e.g. - a family member's wedding)", then let me know now. Something like that we can work through and we can plan for the absence. Letting us know the week before a performance is not appropriate. On the grade specific pages you will find what the students should wear at all of their concerts. The concert attire will be the same for each of their performances this year. All grade levels will be using Standards Based Grading this year. We will be using Skyward to record assessments and you will be able to check it as often as you want. As of last week, each grade level has material that will need to be prepared at home. Please take 5 - 10 minutes each weekend and ask your child to play for you. Links to the pieces that they will be playing will be placed on their respective grade level page. Turn on the recording and ask your child to play their part. If your child tells you they have nothing to work on, then let me know and I will give you a detailed list. Instruments MUST go home at the end of each week. Students can take their instrument home as often as they want but it must go home the end of each week. If your child is involved with choir on Friday, then we expect those students to take their instruments home on Thursday night. We have covered all of the things listed above with the students multiple times since the beginning of the year. ****Check your respective grade level page for some announcements concerning our concerts. I will also upload a document that contains all of the concert dates as well as put them in the "announcement" box on the lower right hand side of the page. Try to get into a habit of looking at the page at least once a week. The picture / archive page will have pictures and / or announcements that were made that will help tell a little history of the band when new students, parents and teachers work with the program. This year marks the 51st first day of school that Mr. Swallow has experienced. This year's 7th graders will be the last class Mr. Swallow teachers all four years while they are at Chiddix. Mr. Swallow has taught in each of the 16 current elementary schools; at both Field and Brigham when these two buildings were used to house an elementary school; all four junior highs as well as at both high schools. This includes the old NCHS as well as the new NCHS and the old Towanda Elementary as well as the new building. Sat., April 6, 2019 S & E contest, 7/8 Cornerstone Chr. Acad. **Attendance required at these events for that particular grade level. This website is owned and operated by the Unit 5 Music Parents Organization.